ምዕንዛዝ- ጽላለ ድዩ ወይስ መድሓኒት? 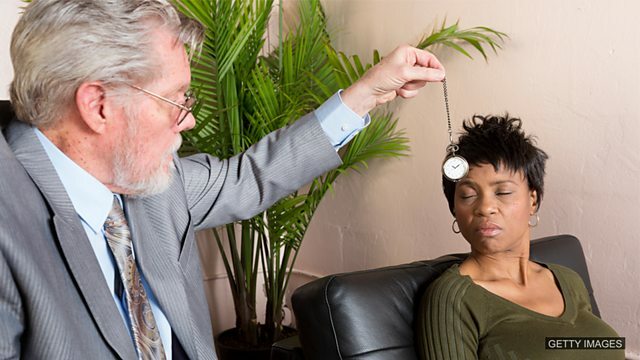 When was hypnotism first used by a European doctor? Hi everyone, I'm Tom. Welcome to today's episode of English Together. And I'm Sian. Hi everyone! Uhm, what's that on your T-shirt, Sian? Huh? Oh, this? It's a clown. I actually have a fear of clowns. 'Clowns' ኣብ መድረኽ ኣዘናጋዒ ሰብ'ዩ። Actually, Tom, in today's episode we are talking about something that might help you with your fear – 'hypnotism'። ሎሚ ብዛዕባምዕንዛዝ ክንዛረብ ኢና። ምዕንዛዝ ካብ ጥንቲ ዘበነ ግብጺ ኣትሒዙ ንኣስታት ኣሽሓት ዓመታት ዝጥቀሙሉ ዝነበረ'ዩ፤ ኮይኑ ግን ንምዕንዛዝ ንመጀመርታ እዋን ከም መድሃኒት ዝተጠቕመሉ ኣውስትሪያዊ ዶክተር'ዩ። መዓስ ይመስለኩም? Which are pretty common phobias! Not like a phobia of clowns, Tom. Would you consider hypnotism to help address your phobia? Wait! Were we listening to the same clip? Didn't you hear them talking about the significant risks? You're just proving my point! But you're only focusing on the risks. There are also clear, tangible benefits. 'Tangible' ጭቡጥ ማለት'ዩ፤ ከምኡ'ውን 'benefits' ረብሓ ኣንጻሩ ከኣ 'risks'. Are you speaking from experience, Sian? Not from personal experience, no, but I have a friend who did hypnotism to help him quit smoking. And it worked! That's an example of a tangible benefit. Well, I have heard that it can help people to kick habits but I'm still not convinced, I'm not sure. You'll only know if you try! If you address a problem, you look for a solution. So, addressing a phobia means 'looking for a solution for that phobia'. I addressed my phobia of spiders by buying one as a pet. He hired a therapist to help him address his phobia of crowded places! Kicking a habit means to stop something negative. A habit is a specific behaviour that becomes repeated and is difficult to stop. She asked her doctor to help her kick her smoking habit. He was determined to make his children kick their TV habit. Clear benefits are positive consequences that can be easily seen. Tangible benefits are positive consequences that can be easily felt. The tangible benefit of starting to exercise was the weight that he lost. The clear benefit of saving more money at the end of every month was the holiday they could afford at the end of the year. Significant or serious risks are things which are particularly dangerous. If you do not drive carefully, there is a serious risk of an accident. There is a significant risk of getting lost if you go to the desert alone. Smoking is a ______ to your health. There’s no question it’s bad for you. Louise can't stop smoking. She has tried everything to ___ . Would you allow someone to hypnotise you? Do you think that there could be tangible benefits? Or do you think the risks are too significant? Tell us on our Facebook group.